Attache gains +1 skill for each Government character you control. Your Government characters gain (A). Flavor Text: She was the general’s voice and ears. Danigral - 3 out of 5. 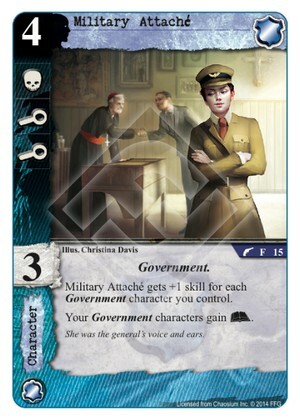 While not as powerful as Syndicate’s Inner Council, this stands to become as much a centerpiece of a Government deck as Inner Council is for Criminal decks, simply because it’s non-unique and can front a lot of skill.. Getting multiple of these out will allow Agency to really have a lot of story presence on attack and defense. mnBroncos - 4 out of 5. Have to sorta build around, however, again you're gaining one of Agencies weaker icons on a lot of characters if you build around this. Very solid card but nothing too flashy. Obtuse - 4 out of 5. One of the centerpieces to the mono Agency Government deck. She doles out the much needed arcane to her other Government cronies and can potentially pack a ton of skill. Kamacausey - 3 out of 5. She will only see play in the government deck obviously but she does give the government boys in blue a much needed arcane icon and gets rewarded for all the government cronies she's helping out. I think for 4 cost though she should have been a little more resilient with willpower and/or toughness. livingend - 2 out of 5. Excuse my French, but Attaché will only see play in exactly one deck. The more powerful the mono-Agency government deck turns out to be, the more powerful we will perceive this card to be. Now that I think about it, I could even envision a scenario where she falls completely by the wayside and we’re jamming 3x The Company instead. Verdict: Does that make 2-1 for the ladies? WWDrakey & Ire - 5 out of 5. The thing is, from now on Lt. Wilson Stewart and Special Agent Clarkston will be the heart of Government decks. And one thing with Clarkston is, that the perfect drop for a post-Clarkston turn is a 4-cost Government character (since you already built the domain up to 3). Now, The Company may be a logical first choice, but all these aforementioned cards have somethign in common. Some lack. And this here gal? She fixes that, and brings an even bigger skill to the board than The Company while at it. Card name is incorrect, missing the Military part. This card fascinates me. It's almost asking the player, "how badly do you want your Government deck to have arcane?" For anyone who plays Call of Duty Zombies, it's like the Mule Kick perk. "How much are you willing to pay for that 3rd weapon? Will you pay 4000 points?" In the case of Military Attache, you're paying through the nose for an icon (arcane) that every Government deck is desperately seeking. And you might find that just one turn of having lots of arcane is enough. One turn of unrestrained aggression from the Government can be really devastating. That said, paying 4 for a character that is vulnerable to all sorts of removal/insanity is pretty rough. Marshall Greene, The Company, and similar cards can give the Attache a welcome boost, and Agency is the king of protection, but you better believe the Attache is going to attract all your opponent's removal until she's dealt with. Better make her count while you've got her.